A famous painting depicting this dramatic scene with Mary and Jesus outside of the garden tomb can be seen on a fresco in a chapel in Padua, Italy. 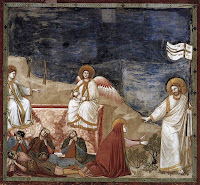 It was painted by Giotto di Bondone in the early 14th century. Jesus is striding from the tomb with a victor’s flag in his left hand. But with his right hand is held out, keeping Mary from coming close. This part of the fresco has been called Noli me tangere (“Do not hold me”). But there are problems with Giotto di Bondone’s interpretation of this biblical story. He depicts the resurrected Christ as aloof, cold, as one who is onward and upward, leaving for higher concerns, one who cannot be held back by this woman. “Do not hold me” seems to mean “I’ve got more important things to do.” And Mary drops to her knees in tears longing for her beloved. Read the entire meditation here.